CLARKSBURG, Mass. (Feb. 2, 2019) — One of upstate New York’s most renowned and recognized winter events is bringing the high-flying action of snocross back to town. 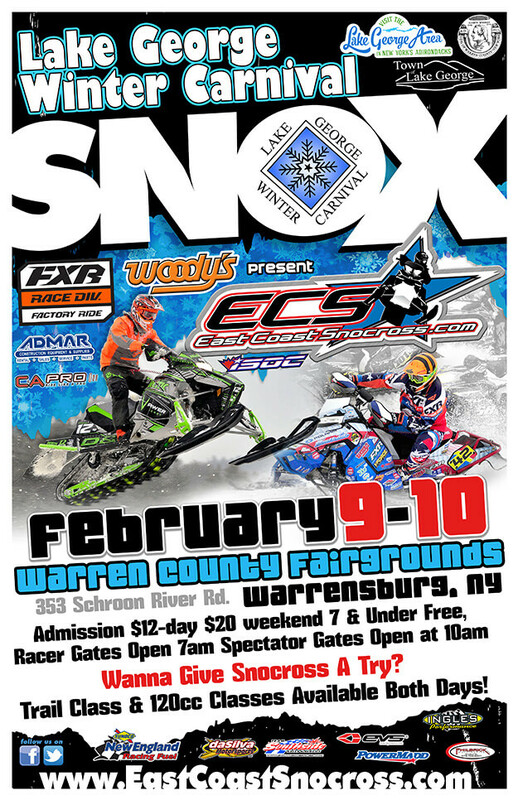 Officials at East Coast Snocross (ECS) are gearing up to be part of the famed Lake George Winter Carnival, as they host Rounds 5 and 6 of the 2019 schedule on Saturday and Sunday, Feb. 9-10, at the Warren County Fairgrounds, in Warrensburg, New York. Leading the charge into Warrensburg is Pro rider Mike Pilotte. The Team Southside Polaris racer from Fall River, Mass., is fresh off a clean sweep of the Finals last weekend in Maine, and says he’s having more fun than ever in 2019. He’ll have to fend off hard chargers like Dylan Roes (D&D Racing Arctic Cat), a successful grass drag racer who is starting to turn some heads in snocross. Some of the riders to watch in the Pro Lite class include Dalton Jacquier, Adam Levi and Wade Acker. Jacquier earned his second win of the season last Saturday, while Levi notched his first victory on Sunday. Other riders to watch in Pro Lite include Tucker Kierstead (D&D Racing/Arctic Cat) and Ryan Dupont (Team Southside/Polaris). All of these young athletes will be contenders in Warrensburg. Along with a full slate of racing in Pro and Pro Lite, the Warrensburg event will also include some good battles in the Sport, Women and Junior divisions. It takes support classes to fill out any card of racing, and the East Coast Snocross series is blessed with strong participation across the board. This new event will also feature a Trail Stock class for those looking to give snocross a try for the first time. Aggressive trail riders with a desire to compete can test their skills in a safe environment. The weekend will also include races for children ages 6 to 10 riding 120cc machines on a separate, smaller track. This is where future stars of the sport learn what racing is all about. The Lake George Winter Carnival was first held back in 1961. Today, this event continues to celebrate all the wonderful wintertime activities in the Adirondacks on four action-packed weekends in the month of February. Run entirely by volunteers, the LGWC is now in its 59th year and going strong. The East Coast Snocross series, presented by Woody’s Traction and FXR, is an ISR-affiliated sanctioning body for snowmobile racing in the northeastern United States. ECS maintains a regional circuit intended to keep grassroots snocross racing healthy in this part of the country, while also cultivating new talent for tomorrow’s factory-backed national Pro teams.